Carrot cake has a way of bringing out alllll the strong opinions. Should it have pineapple? Nuts or no nuts? What about raisins? I have my own strong opinions, and this Carrot Sheet Cake meets all my requirements and then some. It’s super moist, subtly spiced, and topped with a dreamy cream cheese frosting. 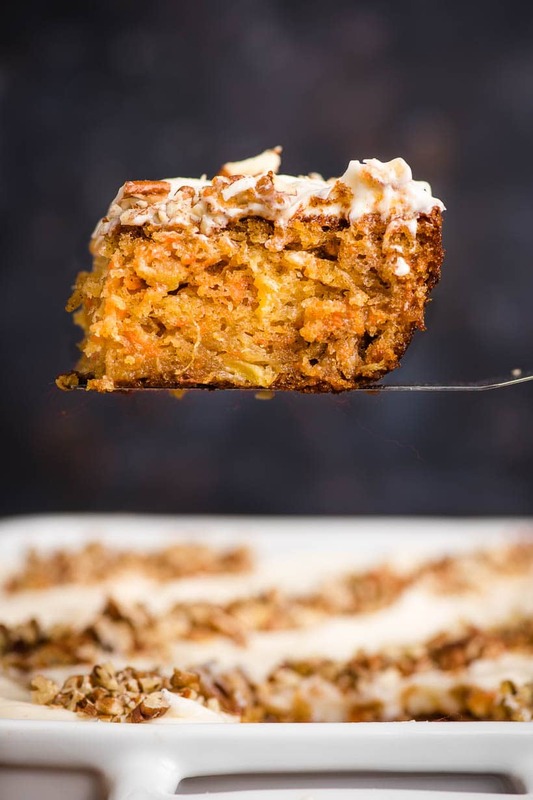 Give it a try, and you might just be convinced this is the best carrot cake recipe! So, what makes this carrot sheet cake so special? 1. First things first–the carrots! 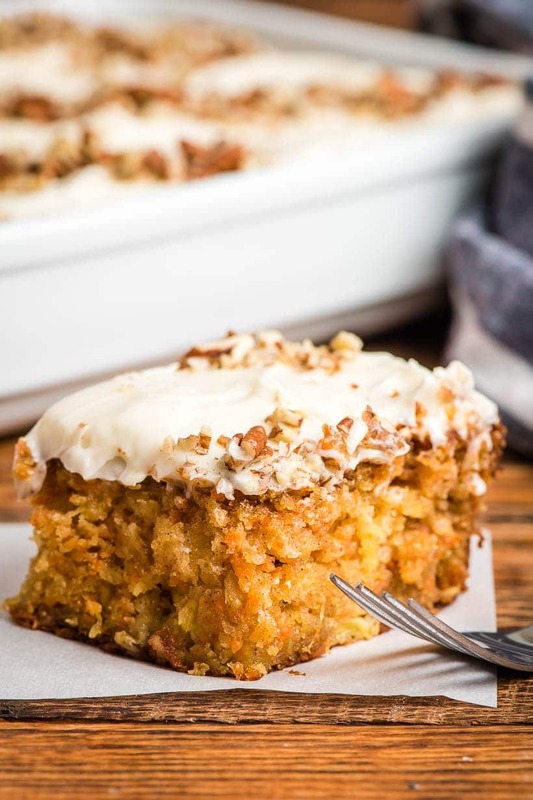 Most carrot cakes call for two cups of shredded carrots, but this one includes three whole cups. More carrots gives this cake a more robust flavor and texture than other recipes. 2. Pineapple! That’s right, I love my carrot cake with pineapple! The pineapple compliments the flavor of the carrots well, and I love the subtle tangy zing it adds. 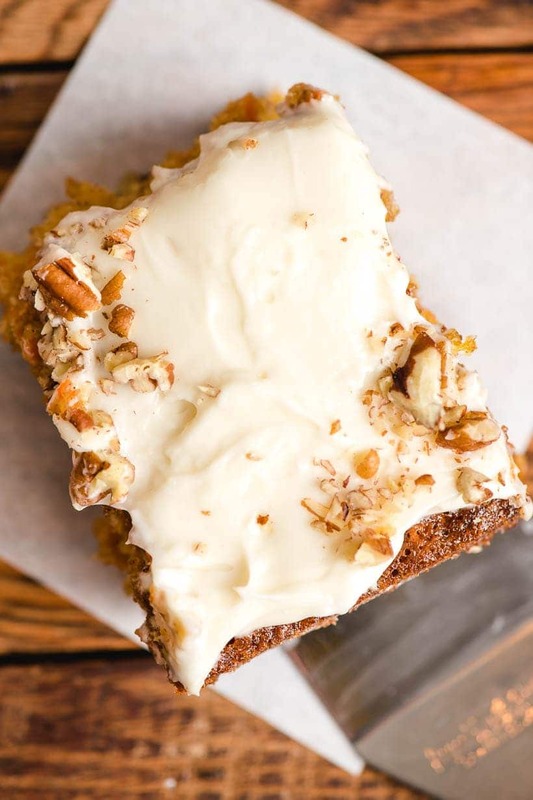 Plus, it makes this carrot cake so incredibly tender and moist. What’s not to love about that? 3. Nuts. I personally love carrot cake with nuts. I like the extra texture a crunchy nut brings to the cake. Pecans are my favorite, but walnuts also work well here. I realize many people are firmly against nuts in their dessert. My simple solution is to add chopped pecans to the top of the cake rather than bake them inside. This way, the nuts can be added to just half the cake, and everyone can be happy! 4. Finally, I’m on team NO RAISINS. I’m not a raisin hater in general. I love a good oatmeal raisin cookie, and a juicy raisin in a Morning Glory Muffin can be delightful. But raisins in carrot cake? They’re just a distraction. I don’t want any unwelcome raisins interrupting my bite of moist, cinnamony carrot cake. If you are on Team Raisins, feel free to add them. I always recommend soaking them in liquid before adding to the batter so they’re nice and juicy instead of dry. Water, orange juice, or pineapple juice all work great for this! 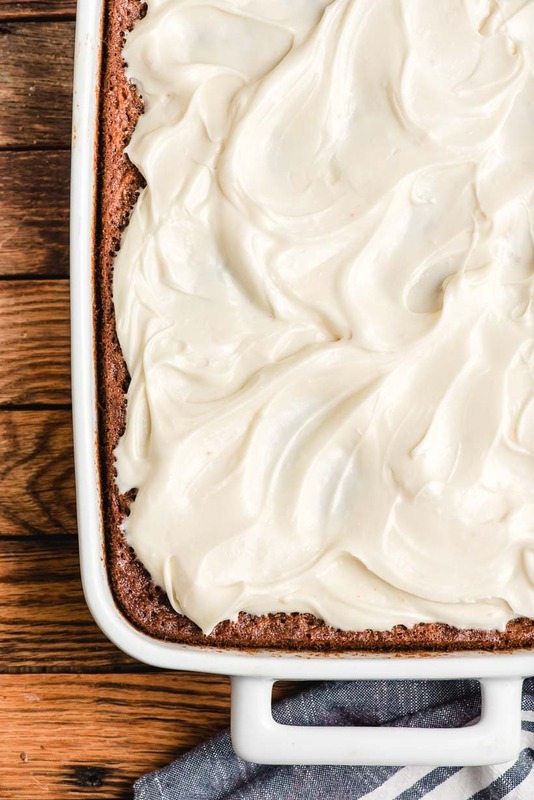 What Frosting Goes with Carrot Sheet Cake? For this question, I don’t think there’s much debate. 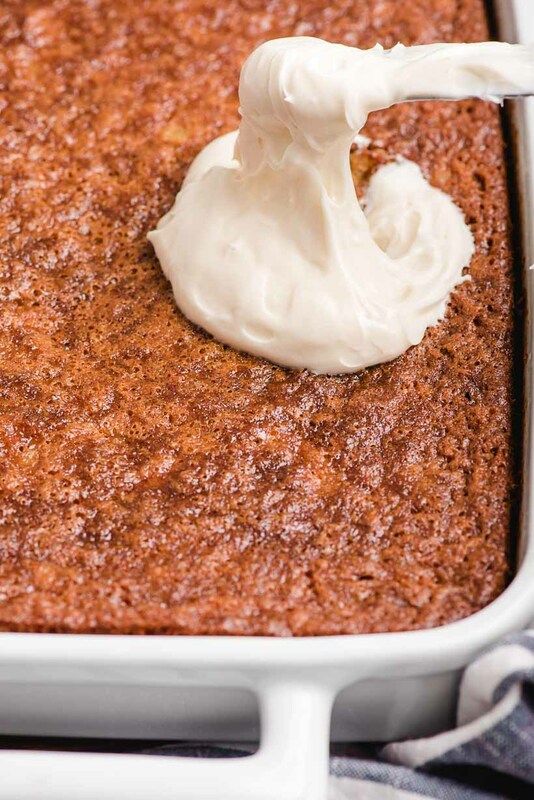 Cream cheese frosting is the absolute best frosting for carrot cake. 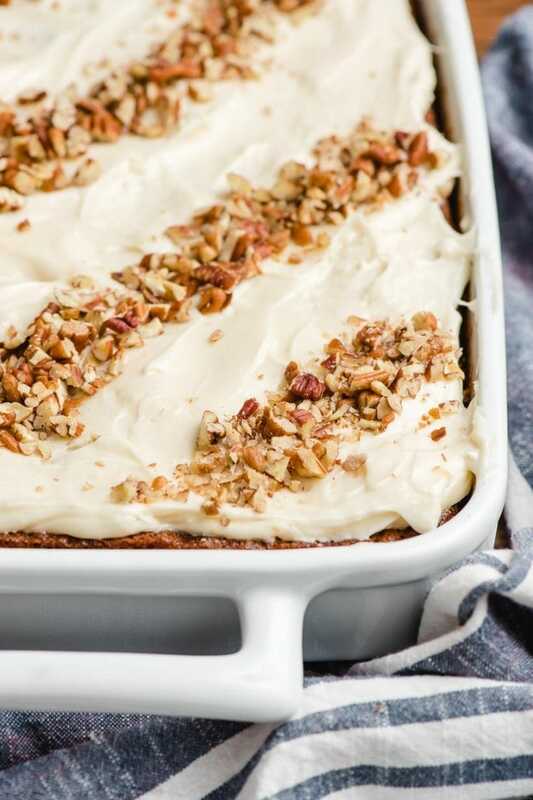 The slight tang of cream cheese frosting compliments this spiced carrot cake perfectly. I like my cream cheese frosting to be heavy on the cream cheese and not overly sweet. This recipe calls for two sticks of cream cheese and only one stick of butter, so the cream cheese flavor really shines! Make sure your cream cheese and butter are at room temperature and sift your powdered sugar to ensure an extra creamy, smooth cream cheese frosting. 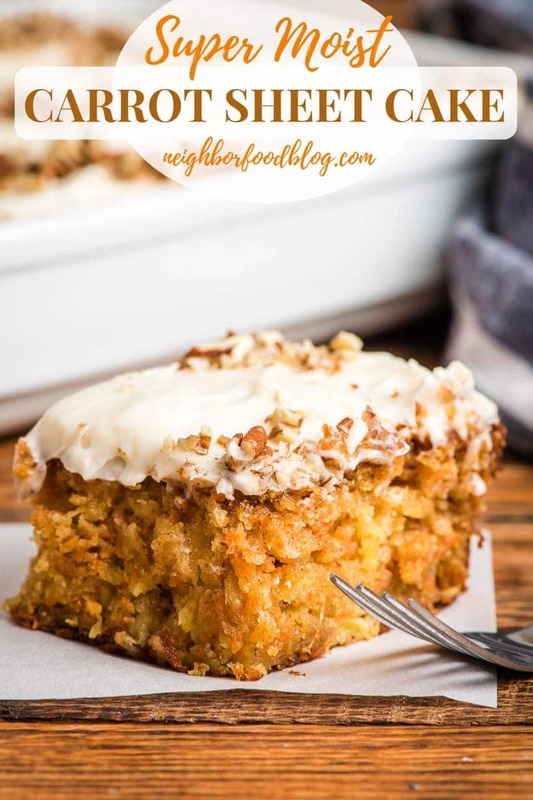 Layer carrot cakes are obviously gorgeous and perfect for special occasions, but I really love the simplicity of a great carrot sheet cake. Sheet cakes are so easy to make. They don’t involve any stacking or torting, and frosting them takes about 2 minutes, tops. Sheet cakes are great for feeding a crowd, and for bringing to potlucks and casual gatherings. My Zucchini Cake with Cream Cheese Frosting and Chocolate Crazy Cake are regulars in our rotation. I make my sheet cakes in a 9 x 13 inch pan rather than a half sheet pan, because I prefer thicker slices of cake. Feel free to use a bigger pan, but be sure to reduce the baking time. This Carrot Sheet Cake can be stored in an airtight container at room temperature for 2-3 days, even after it’s been frosted. Can I bake carrot cake ahead of time? This Carrot Sheet Cake keeps very well. In fact, I actually think it gets better the second and third days! If you’d like to keep the cake longer than a few days, store it in the fridge, and if you’d like to make it very far in advance, I recommend wrapping it in saran wrap and storing it in the freezer. You can thaw the cake in the fridge overnight then frost as usual! This cake is really lovely for any occasion, but it’s often served at Easter and other spring events. If you’re looking for more wonderful Easter recipes to add to your menu, check out this Green Pea Soup with Candied Bacon, Slow Cooker Honey Mustard Ham, Balsamic Asparagus with Goat Cheese, and Resurrection Rolls. 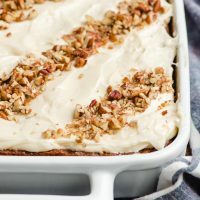 Moist carrot sheet cake with cream cheese frosting is an easy dessert that's perfect for any occasion! Preheat the oven to 350 degrees. Grease and flour a 9 x 13 inch baking pan and set aside. In a bowl, whisk together the flour, cinnamon, baking soda, baking powder, and salt. Stir in the grated carrots until they're well coated. 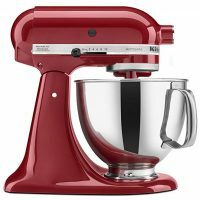 In the bowl of an electric mixer, beat the sugar and oil on medium speed until smooth and creamy. Add the eggs, one at a time, beating well after each addition. Slowly beat in the pineapple. Pour the carrot and flour mixture into the egg mixture and beat on low speed until combined. 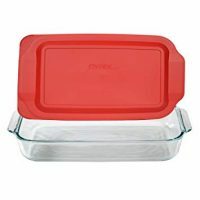 Pour the batter into the prepared pan and bake for 45-55 minutes, or until a toothpick inserted in the center comes out clean and is no longer jiggly in the center. Allow the cake to cool before frosting. Beat together the cream cheese and butter until smooth. Add the powdered sugar, one cup at a time, and beat until smooth. Beat in the vanilla extract and 1 Tablespoon of milk. If the frosting is still a little thicker than you'd like, add more milk, a Tablespoon at a time, until it's easily spreadable. Spread frosting on the cooled cake. Top with nuts, if desired. The frosted cake can be stored at room temperature for 2-3 days, or in the fridge for 5-7 days. To make the cake ahead of time, bake and cool completely. Cover unfrosted cake tightly with saran wrap then freeze for up to three months. Thaw in the fridge overnight, then frost as usual before serving.